We all fear change to some degree wouldn’t it be great if we could set our fear of change aside by simply tossing it into a jar. 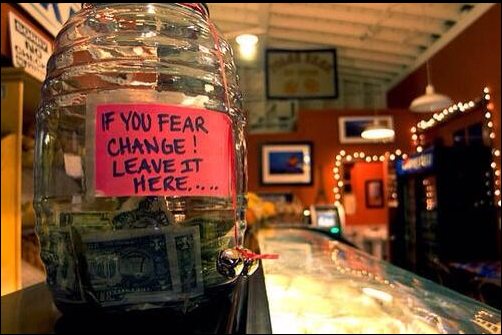 Do you know why we fear change? We fear change because change is about loss. Change involves doing or thinking something different than what we know. Most of us do what we know every day and what we know works for us, that’s why we do it. When we change, we give up what we know and replace it with something we don’t know and that’s the basis of the fear associated with change, the unknown. Will what I’m doing differently work, will I be as efficient, will it be harder, will it take more time? All questions that prevent us from embracing change. Let me answer each question for you: Will it work – maybe. Will I be as efficient – not at first. Will it be harder – to start with. Will it take more time – most likely. Here’s a test, try brushing your teeth with your non-dominant hand. I have been doing it for two weeks. When I started it was hard. It took twice as long and I wasn’t efficient. The first few times I had to repeat the process with my dominant hand but you know what, after two weeks I’m pretty good at it and I’m getting better every day. Change is going to happen especially in the work environment. Every day there are new tests and treatments that benefit our patients. The EMR changes and it slows us down. We have re-routed traffic in our parking lot for construction and we will continue to deal with construction issues for the next 12 months. Change is going to happen but change comes easier when the culture we work in accepts change. Culture is behavior and we must promote a culture that accepts change and provides people a safe environment to work through the process of change. This is the very reason helping people understand the “Why” is so important. No one wants to change because change is hard but when people understand the need for change and they understand that no one expects them to be competent with new tasks day one they are willing to try the change. Explaining the “Why’ and tolerating change are an important aspect of culture. Remember, culture is behavior. When culture accepts and promotes change in a positive and safe manner change is easier to accept. Behavior is important when accepting change and behavior is just as important when asking someone to change. The right culture helps with both.